View sensitive differential pressure and vacuum switch specifications. 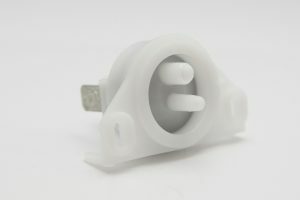 Presair’s sensitive single pole switches can be adapted to pressure or vacuum switches (from .25 IN.W.G. to 45 IN.W.G.) or as differential pressure switches. These “slow make, slow break” switches can respond to rapid pulsing and the gold plated silver contacts will handle low level switching currents. Optional adjustable air bleeds can be supplied on either side of the diaphragm for pulse-sensing application safe edges or bellows. Rating: 750 ma @ 250 VAC to 5 ma @ 3 VDC; 1 AMP @ 250 VAC to 5 ma @ 3 VDC. UL Recognized for 100,000 operations. Material: Acetal body; EPDM diaphragm bonded to steel ring; other diaphragm materials are available; gold plated silver contacts; silver plated bronze springs; silver plated copper or brass terminals. These switches are not available for sale online. Give us a call with your application specifications and our direct customer service would be happy to help you find the right switch to fit your needs, 715-831-6353.